This cat is tired of his owners being away from home all the time and leaving him only with plain old cat food around to eat. He decided to go grab some burgers and he wants to try and collect them from all around the world. Taking his pillow he started to like burgers very much and she wants one from each level. 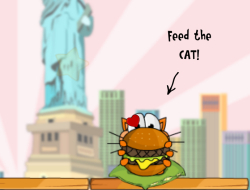 Do your best to remove the objects blocking the burger from reaching the cat and try to collect all the stars with it so she will like it even more. There are three stars on each level and you shouldnt give up trying until you collect all. Cat Around the World 10.00 between 0 and 10 based on 1 votes.